I first heard of the PlugBug by TwelveSouth about a year ago, when a number of gadget-inclined friends started raving about it. The PlugBug is actually quite genius in its simplicity – it attaches to your Mac laptop power brick where the usual wall-plug snaps in, and adds a USB port to it, allowing you to charge your USB-powered devices at the same time. Bonus: it packs 2.1-Amp of charging power, so it’s going to charge your devices much faster than plugging them in to your computer. This is especially true when it comes to tablets. I have actually encountered computers whose USB ports aren’t powerful enough to charge my iPad Mini. And forget about getting a meaningful charge between flights or appointments. This year, at CU Exposed, the TwelveSouth team had brought along their latest version: the PlugBug World Travel Adapter. Again, nothing revolutionary here, just the addition of five snap-on ends to make your PlugBug compatible with international outlets. Considering I like to travel light, anything that’s going to lighten my load is a plus. Being able to eliminate a few cables and adapters, and achieve faster charging is great. 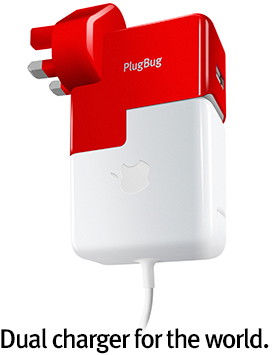 I’m totally putting a PlugBug World charger on my travel wish list.